FAST IMMEDIATE DELIVERY ON LARGE ORDERS! Click on this link if you need more information about Strain Gauge. OMEGA™ transducer quality strain gages are available in a variety of patterns to cover most transducer design requirements. Their rugged construction, reliability and flexibility make them suitable for highly accurate static and dynamic transducers. The measuring grid is formed by specially formulated etching constantan foil, which is then completely sealed for long term reliability in a carrier medium composed of polyimide film. If the delivery time shows 6 weeks or more, please call our Sales team, as most times we can ship in 2 WEEKS. 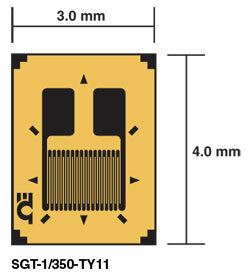 Nota: Sold in packages of 5 strain gauges.